Study any disease or health condition, and you’ll usually find a list of things that may cause or contribute to the condition. For instance, cigarette smoking increases your risk of lung cancer, or obesity increases your risk of heart disease. There are usually several risk factors included, but one thing you’ll rarely see listed is inflammation. Yet, chronic inflammation has been linked to most health conditions, including obesity. It is time to bring inflammation fully out of the shadows, address the effect it has on our health. Once we do that, we can finally reduce the rates of most diseases in this world, including overweight and obesity. In simple terms, inflammation is the body’s response to tissue damage. This damage can be created by a wound, bacteria, or foreign invader in the system. Inflammation itself is not bad. It is your body’s first line of defense against injury, and if you didn’t have an inflammatory response, you would not survive an injury or illness. It’s when inflammation becomes chronic that it becomes a problem. Your body is an amazing machine that knows just what to do to protect you from injury or disease. The minute you suffer tissue damage from a wound or foreign invader, the tissues release chemicals that induce swelling around the site of the wound or invasion. This keeps the area separate from healthy tissue. If the wound is close to the surface of the skin, there will be swelling and warmth at the site of the injury. Meanwhile, the immune system sends an army of immune cells to fight the foreign invaders and heal the injury. Openings appear in the inflammation surrounding the site of the injury to allow the immune cells to enter. Once their job is complete, the body sends anti-inflammatory chemicals to end the inflammation. With chronic inflammation, the inflammation doesn’t end. This can happen when the immune system mistakenly sees something as a threat, or if the immune response is repeatedly triggered. For instance, frequent exposure to environmental chemicals can cause low-grade inflammation because these chemicals are always in your system, and the immune system cannot get rid of them. When the immune system sends immune cells to fight a threat that is not real, they float around with nothing to do. Eventually, they start attacking the body’s own tissues. The tissues then release chemicals causing inflammation, which brings more immune cells to fight a non-existent threat. It’s a vicious circle that causes chronic inflammation that affects your health in dangerous ways. For instance, if your immune cells attack your heart tissues, causing inflammation, you can develop heart disease. If your immune cells attack your kidneys, causing inflammation, you can develop kidney disease. Here is a list of foods/food categories known to cause chronic inflammation if consumed in excess. Sugar-sweetened beverages. Sugar is proven to cause inflammation. As previously mentioned, chronic inflammation is likely the root of most diseases. There are more than 100 inflammatory diseases. Here are a few of them. And let’s not forget about obesity. Studies are showing neurological inflammation — specifically hypothalamic inflammation — could be the main cause of weight gain and obesity. How is this possible? You see, the hypothalamus, located in the center of your brain, is the control center of your metabolism. When it functions properly, it balances your weight properly. Meaning, when you eat more calories, your body burns more calories. 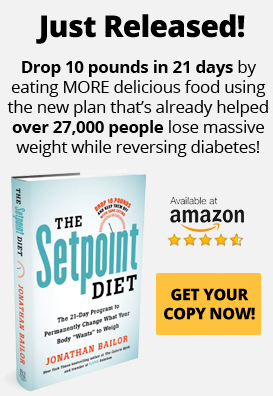 It automatically balances your weight at a healthy SANE setpoint weight. You don’t have to count calories or watch what you eat. Your hypothalamus handles everything for you. The hypothalamus takes its cues from the hormones leptin and insulin that continually signal how much fat you have and need. It has been proven that hypothalamic inflammation causes leptin resistance, a hormone that regulates appetite and metabolism through the hypothalamus. When the hypothalamus becomes resistant to leptin, glucose and fat metabolism disrupted. Insulin resistance, the main cause of weight gain, then develops. In short, when the hypothalamus becomes inflamed, it no longer receives these signal correctly. It doesn’t know how much fat you have or need. All it knows is it needs to keep you alive, which is its number one mission, so it gives you more fat to be on the safe side. With neurological inflammation, your hypothalamus and hormones no longer work to keep you slim. They work to make you hold onto fat as much and as long as possible. It doesn’t matter how little you eat or how long or intensely you exercise, your hypothalamus will work to keep you near your setpoint weight. This raises your setpoint weight, making it almost impossible for you to achieve long-term weight loss until the neurological inflammation is resolved. To reduce your risk of obesity and many other diseases, you’ll need to cure chronic inflammation. One of the best ways to do that is through diet. Here are some simple dietary steps you can take to reduce inflammation and live your healthiest life. Many foods have been shown to have an anti-inflammatory effect on the body. Here are 5 of the top anti-inflammatory superfoods you’ll want to add to your diet. Leafy green vegetables are nutritional powerhouses, superfoods for any condition. They are high in fiber, a nutrient that fills you up fast and keeps you full for a long time. They also stay in your digestive tract for a long time, burning calories while your body tries to break them down until they are eliminated to make you “regular.” They also contain high amounts of vitamins C and K and the minerals iron and calcium. Leafy green vegetables also contain high amounts of vitamin E and other vitamins and nutrients that have an anti-inflammatory effect on the body. Salmon and other oily fish contain high amounts of omega-3 fatty acids. Research shows omega 3s have powerful anti-inflammatory properties that can significantly reduce or eliminate inflammation if consumed in adequate amounts. To ensure salmon and other oily fish have the highest amounts of omega 3s, try to choose the wild-caught variety. Other oily fish include tuna, herring, sardines, mackerel, and trout. Almonds are high in vitamin E, known to reduce inflammation. They also contain high amounts of unsaturated fats that lubricate joints and reduce inflammation. Almonds are also a great plant-based source of omega-3 fatty acids, including alpha-linoleic acid. This makes almonds, like salmon, a powerful anti-inflammatory. But almonds aren’t the only nuts with anti-inflammatory effects. In fact, all nuts contain vitamins, minerals, and other nutrients known to reduce inflammation. Ginger, that aromatic spice often used during the winter holidays, is also a powerful anti-inflammatory herb. It contains phytonutrients called gingerols, which are some of the most powerful inflammation-fighting substances known. Do you need scientific proof? Many studies show that the anti-inflammatory effects of ginger are as strong as those of non-steroidal anti-inflammatory drugs (NSAIDS), such as aspirin, Advil, and Motrin. The acai berry, a fruit native to Central and South America, contains more antioxidants than any of the more popular berries, such as blueberries and strawberries. They are also loaded with the antioxidants flavonoids and procyanidins, which prevents free-radical damage, protecting the body from disease. Research shows acai berries may suppress production of interleukins and cyclooxygenases, inflammatory chemicals made by cells. This is another berry with strong anti-inflammatory properties. Blueberries contain quercetin, an antioxidant with potent anti-inflammatory abilities. Quercetin, a phytonutrient plentiful in fresh produce, has been shown to fight inflammation in many studies. One such study showed increasing blueberry consumption slowed cognitive decline, which improves memory. Researchers believe this is because blueberries prevent oxidative stress, thus preventing the inflammatory response. Eating a SANE diet will reduce or prevent inflammation too, and it’s amazingly easy to do. You don’t have to count calories or write down the foods you eat. All you have to focus on is eating 3 types of foods at every meal. Most of the foods on the SANE Diet have anti-inflammatory properties. Eating them together supercharges their anti-inflammatory effects. 10+ servings per day. A good rule of thumb is to fill half your plate with non-starchy vegetables at every meal or whip up anti-inflammatory green smoothies. 3-5 servings per day, 30-50 grams per meal. Fill a third of your plate with nutrient-dense protein at each meal. Nutrient-dense proteins are those that contain more calories from protein than they do from carbs, fiber, or fat. 3-6 servings per day. Fill the remainder of your plate with whole-food fats. 0-3 servings per day. You are also free to top of your meal with a serving of low fructose fruit. You can also enjoy it as a between-meal snack. The SANE lifestyle isn’t just about eating certain foods that lower your setpoint weight and reduce inflammation. It is also about making lifestyle adjustment that help you to live your best life, inflammation free. These lifestyle changes have been proven to reduce inflammation. Chronic stress creates oxidative damage to your cells, leading to inflammation. To counteract this danger, look for opportunities to reduce stress whenever you can. Here are a few suggestions to help you relax. Forget your worries with a good book. Practice slow, deep breathing techniques. Meditate 10-20 minutes each day, preferably in the morning before beginning your day. Practice yoga, tai chi, or any other meditative physical exercise. Take a leisurely walk in the park. Studies show sleep deprivation raises levels of cortisol, causing stress on your body. To counteract this risk, try to get 7-8 hours of uninterrupted sleep per night. Here are some tips to help you get enough sleep. Quiet your mind. Most people go to bed with the problems of their day still racing in through their minds. To prevent this problem, try to quiet your mind before even getting into bed. Just sit in a chair, close your eyes, and breathe slowly, counting your breaths. When thoughts intrude, acknowledge them, and then go back to counting your breaths. Put away your smartphone. Looking at your phone screen right before bed affect levels of melatonin, preventing you from going to sleep. Try to avoid doing anything on your smartphone an hour before bedtime. Make your bedroom sleep-ready. This means making it as dark and quiet as possible, and at the correct temperature for quality sleep. These tips and the SANE diet should reduce or prevent inflammation, improving your health and helping you lose weight.